Present in late October and early November 2009, also just under one year ago in December 2015; Egypt’s Mohamed Gharib is once again in the west African country. He is present to conduct a Developing a National Sports Structure Course. Supported by Olympic Solidarity and organised under the auspices of the ITTF Development Programme, the itinerary commenced on Saturday 12th November and will conclude on Tuesday 13th December. The major task for Mohamed Gharib is to establish a strong base with regards to administration and coaching, in addition to raising playing standards. 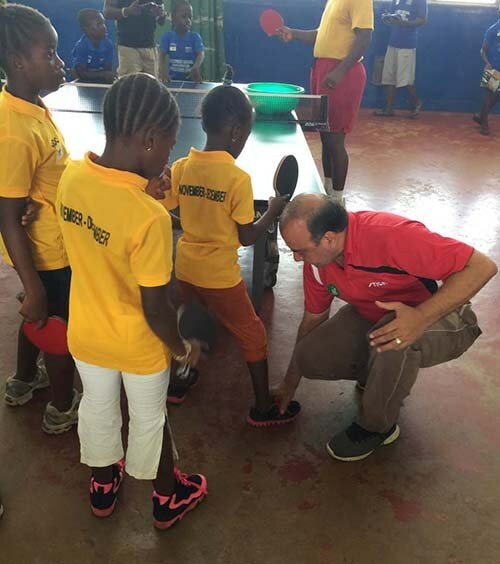 Thus following discussions with Lakish Alie, the President of the Sierra Leone Table Tennis Federation, an agreement was reached to focus very much on junior players with local coaches in attendance. A ten day coaching session was organised; a total of 28 players, 14 boys and 14 girls attended, all being aged seven years to 11 years of age and new to the sport of table tennis. Five established junior players and five coaches attended to assist with the coaching. “I am very happy when I watch beginners, every day they learn quickly, also coaches are learning something new every day”, Mohamed Gharib. Following the conclusion of the course on Monday 21st November, the best six boys and best six girls will join the five junior players for training camp that will last 20 days, commencing on Monday 28th November and concluding on Saturday 17th December. Later the three best players will be invited to practise in Egypt as preparation for the 2017 African Championships.